The 10 Best BBQ Joints in Kentucky! If you’re in the Southern half of the United States, you’re in barbecue country. And if you’re in Kentucky, you’ve got a world of options. No matter what part of the state you find yourself in, there’s a place offering sweet, spicy, and savory barbecue options. Find everything from pulled pork to ribs to chicken at the 10 best barbecue joints in the state. The Woodshed Barbeque and Restaurant is just the place you want to be if you love good old-fashioned barbecue. Located in Hopkinsville, Kentucky, the Woodshed is open every day except Sunday from 10:30 a.m. until 8 p.m., and serves up delicious pulled pork sandwiches. Of course, they have traditional Southern food like fried catfish and burgoo, and the portions are so large that you might need a doggie bag to take home. There are daily specials that include your choice of meat and three sides. With only a dream and a passion for barbecue, Jeff Lewis opened Wildfire BBQ and Grill in Franklin, Kentucky, in 2005, and continues the same great service and delicious food he’s always had. The no-nonsense diner might be understated in looks, but gets high marks and rave recommendations on social media sites. Hungry diners can choose sandwiches like barbecue pulled pork, brisket, smoked bologna, and grilled chicken or burger, and you can turn your order into a dinner plate that comes with two sides like white beans, turnip greens, coleslaw, mac and cheese, onion rings, green beans, fried apples, and more. Open every day except Sunday, you can count on homemade barbecue sauces and everything else on the menu being made fresh daily. Customer satisfaction is high on the priority list, too. It’s a family affair at Smoky Pig Bar-B-Q in Bowling Green, Kentucky. This casual eatery featuring Kentucky-style barbecue has been serving lick-your-lips food since 1999. Always busy filling take-out and dine-in orders, if you enjoy pork, brisket, beef, or chicken barbecue, then this is the place for you. Alton Brown, host of numerous cooking shows on the Food Network including “Feasting on Asphalt,” featured some of the mouthwatering thin-sliced vinegar-based shoulder cuts from Smokey Pig on the show. You can get your fill of this Kentucky original any day but Sunday. Following in their parents’ footsteps of offering the best dining experience in the area, the owners of Roy’s Bar-B-Q in Russellville, Kentucky, have made this casual barbecue place a dining destination. Everything sold here is made from locally sourced ingredients, and includes a menu full of barbecue pork, beef, and chicken selections and more sides than you can imagine. There are lunch and dinner specials daily, and you can’t forget about dessert, even if you have to take one of the homemade pies with you to eat later. Kids will enjoy eating at Roy’s, too, because they have a menu full of kid-friendly entrees. Roy’s is open every day and available for catering your next event. No matter how you slice it or by what name you call it, Hog Wild Pig Crazy Bar-BQ has what you want if you’re craving fine barbecued meats served with a smile. Smoked daily, you’ll have your choice of pulled pork or chicken, sliced beef brisket or smoked sausage or chicken with more homemade sides than you can shake a stick at. You can buy by the sandwich or by the pound, and make sure to invite Hog Wild Pig Crazy to your next tailgate party or birthday party. Open every day, there’s a nice selection of beer to wash down your meal. Based on the tradition of hard work, good food, and a family atmosphere, Bubby’s BBQ in Corbin, Kentucky, takes the job of providing great barbecue to a new level. Known as one of the best buffets in the area, this diner has a Southern smorgasbord of smoked meats, fried catfish, and all the sides you want. Open Wednesday through Sunday, Bubby’s has been in business since 2009. Winner of the Reader’s Choice Award for the best burgoo and barbecue, Old Hickory Bar-B-Que in Owensboro, Kentucky, is the area’s favorite restaurant. With over 100 years of experience, this sixth-generation family carries on the tradition of making great barbecue with mutton, pork, beef, ham, and chicken. 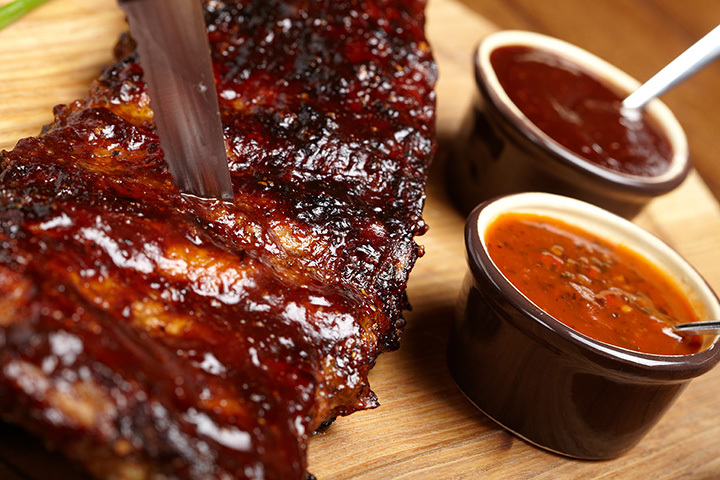 Priding themselves on taking no shortcuts and not sacrificing flavor, the cooks at Old Hickory know how to combine a great sauce with a consistent process to create mouth-watering meats served daily. Where can you find the best fish and chips, pulled pork barbecue, and Guinness gravy? The Celtic Pig BBQ in La Grange, Kentucky, of course! What sounds like something out of a quirky Irish movie, the menu at Celtic Pig is no joke. Owners Melissa Ingram and Sam Bracken share a common heritage to provide great food to everyone and they’ve smoked everything from whole hogs to wild turkeys to alligators. Using traditional cooking methods of Western Kentucky, a repurposed steampunk smoker named Argyle MacGuinness, and freshly made rubs like “Burnin’ Down the Outhouse Hot Sauce,” they’ve won awards for having the best ribs in the state. Scoring high marks consistently on social media sites, Smoke Shack BBQ in Scottsville, Kentucky, is the area’s best place for all things smoked and barbecued. Open Wednesday through Saturday from 10 a.m. until 7 p.m., hungry diners can order sandwiches, plates, half or whole meats and sides, ribs by the slab or by the pound. They also do catering so if you’re looking for a great addition to your next event, ask about having them do all the cooking instead of you. Doc Oblander is the master chef at Doc’s BBQ Smokeshack in Brandenburg, Kentucky, and he’s been smoking meat using traditional Western Kentucky methods for many years. His true barbecue taste has made him an icon in these parts, and he has some of the best dinners around featuring brisket, pulled pork, ribs, chicken, pork chops, meatloaf, and wings. You can even order a ribeye and ribs combo plate with your choice of sides like potato or macaroni salad, mac & cheese, green beans, baked apples, fried okra, sweet potato casserole and more and day of the week except Mondays.